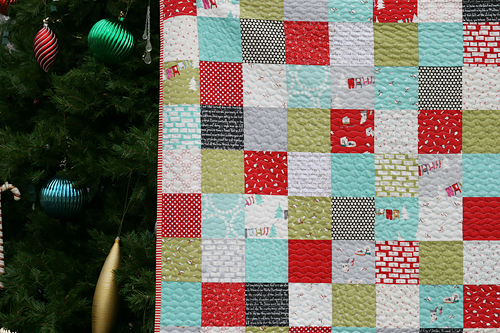 Last week I decided to do a bit of selfish sewing and make my family a Christmas quilt. 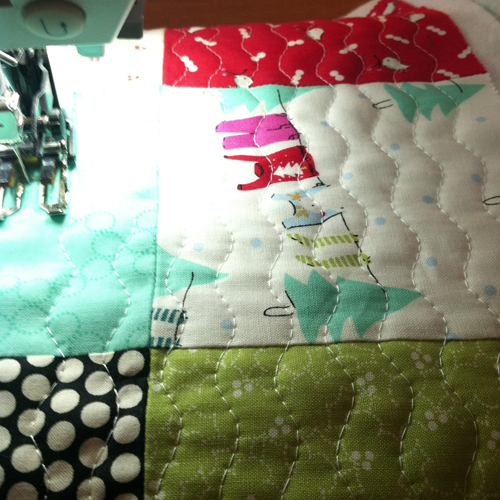 I tend to do all my Christmas sewing the last week in November. Three years ago it was the advent calendar. Last year it was the tree skirt. I guess I'm pretty motivated by a December 1st deadline. 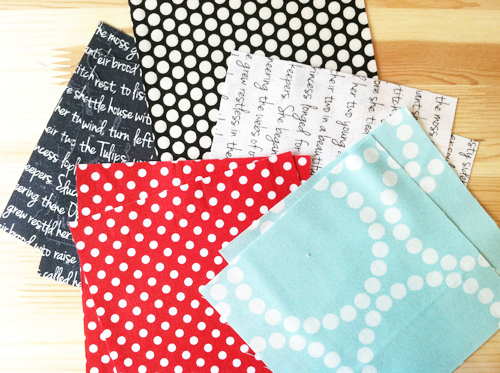 Due to my self imposed short deadline, I chose one of my favorite quick and easy layouts - 5" squares. 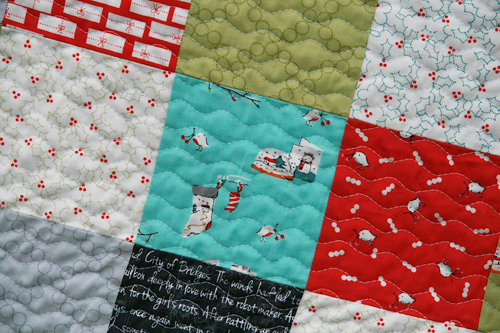 And to make it even easier, I used mostly charm packs from Aneela Hoey's Cherry Christmas line. I really love Aneela's artwork. The designs on the fabric are so pretty and holiday, but in an understated way. For some reason, I decided I just needed to add the black text print from Violet Craft's Madrona Road into the mix. This led to the addition of a few other prints, including some pearl bracelets by Lizzy House, dots from Sarah Jane's Children at play, and a Kei Honeycomb. I really love that punch that the black prints add. A bit of sizing details...I used 4 charm packs and 40 additional cut squares (5" x 5" each). The quilt is 13 columns by 16 rows. It measures around 59" x 72". 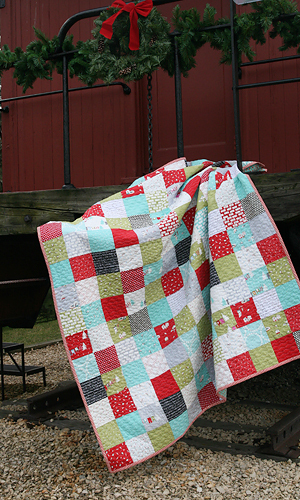 I quilted using a wavy line. On my machine, I use the Running Stitch (Bernina 440QE stitch #4, looks like a zigzag), max out the width and set the length to 4. Although this led to some kind of boring hours of quilting, I love the finished effect. The back is a flannel from Bonnie and Camille's line Vintage Modern. I used 4 yards with a tiny amount left over. I did prewash the flannel...I knew it would shrink a lot more than the cotton on the front. 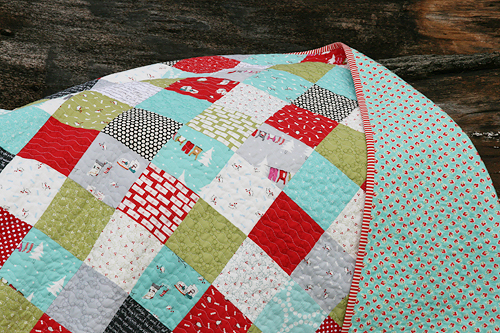 The binding is also from Bonnie and Camille, but their new line Marmalade. 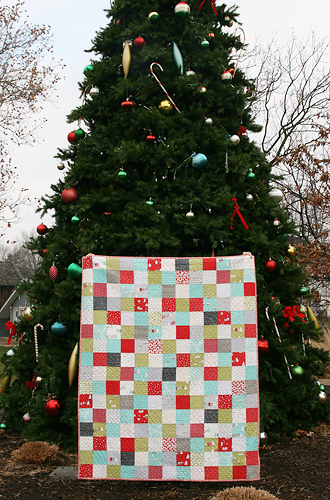 I just couldn't resist it for a Christmas quilt. So now I'm enjoying some snuggles under the quilt, at least until Spring!